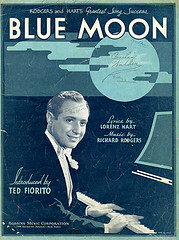 About Blue Moon Although written in 1933, “Blue Moon” first appeared in the 1934 film Manhattan Melodrama, though with a completely different lyric. “Blue Moon” was recorded on June 19, 1957 and released the following year as a single. It was arranged by Ralph Sharon. Blue Moon was recorded on April 8, 1958 and released in 1958 on the album Long Ago and Far Away. It was arranged by Frank DeVol. “Blue Moon” was recorded live on November 28, 1958 but was not released until 2011 on Rarities, Outtakes & Other Delights, Vol. 1, from the Tony Bennett Complete Collection. “Blue Moon” was recorded in July, 1973 and released in 1976 on Tony Bennett Sings 10 Rodgers & Hart Songs.